One of my best friend's lives in Italy, and although she doesn't drink beer she said this is the beer to drink for you challenge. Her basic reasoning was Peroni is crap (I'm not sure I agree), Ichnusa is from where I live so don't have that and you probably can't get much else! Add that to the fact that her boyfriend drinks it when he can afford it and I thought that will do me. So this beer's name in Italian means, the Flying Carpet, this brings me to an interesting link. The famous AFL player Bruce Doull shares the same nickname, the flying carpet, as this beer due to his 'unique hairstyle'. Carlton is situated right in the middle of the Italian community in Melbourne, and there you go one of the more random facts that you will come across on this blog! On to the beer! The pour appears excellent, this is a Euro Pale Lager and this looks pretty close to perfect for the style. The colour is a traditional straw colour and there appears to be excellent carbonation flowing up towards a thick white head. The head bubbles beautifully over the top of the glass, and continues to lace the glass throughout the entirety of drinking. It also doesn't completely disipate, but instead leaves a thin layer on the surface of the beer, in two words this beer looks simply perfect! And unfortunately for my friends boyfriend this is the last time I ever listen to him about beer. The beer doesn't taste skunked, it's just crap! The malts are disgustingly sweet and the hops clash terribly. I was always taught to not say anything if you have nothing nice to say so I'm going to stop right now! 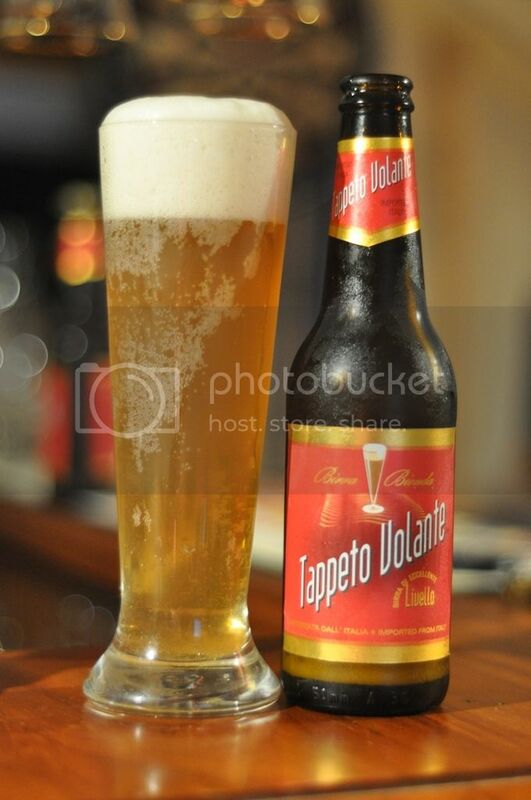 Tappeto Volante has the look of an excellent beer, the pour is fantastic and the packaging is brilliant. Unfortunately that is where the positives stop. I pride myself on being able to finish every beer I try but I did have to pour about half of this out, as it is just that bad! I will never buy it again, and consider this a community service announcement: NEVER BUY THIS BEER, IT'S CRAP!! !